In some circumstances, you may need to convert or save a document as pictures jpeg or other types of image formats in Word. But there is no option for you to quickly save the whole document as image files in Word. Kutools for Word's Export Doc as Images utility can quickly convert or save the document as image file jpeg or other image formats (Png, Gif...). 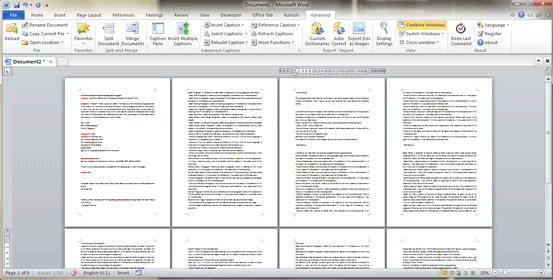 Note: This feature cannot be applied in Word 2003. 1. Please open the document that you want to convert or save as images in Word, and then applying this utility by clicking Kutools Plus > Export / Import > Export Doc as Images. 2. Please specify the settings in the Export Document to Images dialog box. 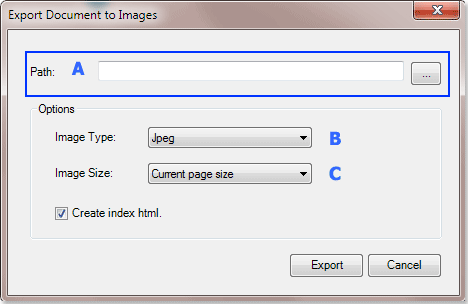 A: Please specify a folder to contain the exporting image files. B: Please choose the image type. C: You can choose to export document with current page size or original page size. 3. Click Export button to begin exporting and when the exporting is finish the saving folder will opened automatically. You will see all the images of the document as shown in the below screenshot.